Simong is a Tibeto-Burman language spoken in the Upper Siang district of Arunachal Pradesh. It is classified as a sub-dialect of the Adi language. As per the Census 2011, there are about only 179 families existing today in the Simong village, located in Yinkiong subdivision in the Upper Siang district of Arunachal Pradesh. The total number of population is only about 672 people in the village. However, most of the young generation has had migrated to the cities of Arunachal Pradesh and elsewhere in the country in search of education and job opportunities. The total population of this community is less than 7000 (approximately) and is mostly scattered throughout the country. Most of the people are land cultivators and depend on agricultural produce for their livelihood. 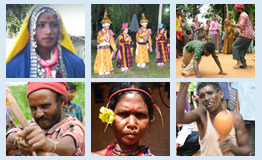 The Simong language is classified as a sub-dialect of the Adi language of the Tibeto-Burman language family. It is considered as one of the endangered languages of Arunachal Pradesh as most youngsters of this community are adopting Hindi as their means of communication. The old generation (60 years and above) amongst the Simong people comprises of monolingual speakers while the people with an average age of 40 years and above are bilinguals speaking Simong and Hindi. The younger generation, however, shows a gradual shift towards Hindi. Adding to this, Simong does not yet have a script of its own and hence has no literature either. Most of the native speakers are familiar with Adi and other related languages of Arunachal Pradesh and therefore rely heavily on the Adi literature. Literacy is relatively low (approximately about 32.76% for males and 20.81% for females, according to the Census 2011). However, efforts are being made to implement the Roman script for Simong. The traditional belief practice of the community is Animism. They believe in worshipping different elements of nature and animal sacrifice is a common ritual held for the atoning of the community. The Simong community mainly practices land cultivation and depends upon agricultural produce for their livelihood. However, many of its younger population are employed in the cities as labourers and if they are educated, then into some offices. The SPPEL project mainly aims to document the ethnolinguistic profile of the Simong community and to further produce a basic grammar and a trilingual dictionary about the same.